It has been suggested that McKay Bay be merged into this article. ( Discuss) Proposed since March 2019. This article is about the body of water. For the demographic region, see Tampa Bay Area. For the city, see Tampa, Florida. For other uses, see Tampa (disambiguation). Tampa Bay is a large natural harbor and shallow estuary connected to the Gulf of Mexico on the west central coast of Florida, comprising Hillsborough Bay, McKay Bay, Old Tampa Bay, Middle Tampa Bay, and Lower Tampa Bay. The largest freshwater inflow into the bay is the Hillsborough River, which flows into Hillsborough Bay in downtown Tampa. Many other smaller rivers and streams also flow into Tampa Bay, resulting in a large watershed area. The shores of Tampa Bay was home to the Weedon Island Culture and then the Safety Harbor Culture for thousands of years. These cultures relied heavily on Tampa Bay for food, and the waters were rich enough that they were one of the few Native American cultures that did not have to farm. When the first European explorers arrived in the early 1500s, the Tocobaga was likely the dominate chiefdom in the area. The indigenous population had been decimated by disease and warfare by the late 1600s, and there were no permanent human settlements in the area for over a century. The United States took possession of Florida in 1821 and established Fort Brooke at the mouth of the Hillsborough River in 1824. Earliest known detailed map of Tampa Bay, by Don Francisco Maria Celi of the Spanish Royal Fleet, 1757. Map is oriented with east at the top. Pinellas peninsula is at bottom, Tampa peninsula in middle, Hillsborough River shown extending into the interior at top left. The earliest evidence of human habitation directly on the shores of Tampa Bay comes from the Manasota culture, a variant of the Weeden Island culture, who lived in the area beginning around 5,000–6,000 years ago, after sea levels had risen to near modern levels and the bay was connected to the Gulf of Mexico. This culture, which relied almost exclusively on the bay for food and other resources, was in turn replaced by the similar Safety Harbor culture by approximately 800 AD. Not finding gold or silver in the vicinity and unable to convert the native inhabitants to Christianity, the Spanish did not remain in the Tampa Bay area for long. However, diseases they introduced decimated the native population over the ensuing decades,  leading to the near-total collapse of every established culture across peninsular Florida. Between this depopulation and the indifference of its colonial owners, the Tampa Bay region would be virtually uninhabited for almost 200 years. Tampa Bay was given different names by early mapmakers. Spanish maps dated from 1584 identifies Tampa Bay as Baya de Spirito Santo ("Bay of the Holy Spirit"). A map dated 1695 identifies the area as Bahia Tampa. Later maps dated 1794  and 1800  show the bay divided with three different names, Tampa Bay west of the Interbay peninsula and Hillsboro Bay on the east with an overall name of Bay of Spiritu Santo. For the next 100 years, many new communities were founded around the bay. Fort Brooke begat Tampa on the northeast shore, Fort Harrison (a minor military outpost on Florida's west coast) begat Clearwater, the trading post of "Braden's Town" developed into Bradenton on the south, and St. Petersburg grew quickly after its founding in the late 19th century, on the western bay shore opposite Tampa. By 2010, the Tampa Bay Area was home to over 4 million residents. Henry B. Plant's railroad line reached the area in 1884 and ran across the Interbay Peninsula to Old Tampa Bay, where he built the town and shipping facility of Port Tampa at its terminus. In 1898, Plant used his connections in the federal government to make Port Tampa a major embarkation point for the U.S. Army during the Spanish–American War, leading to the U.S. Congress appropriating funds for the United States Army Corps of Engineers to begin the first large dredging operation in Tampa Bay. A deep shipping channel was created which linked Port Tampa to the mouth of the bay, enabling Plant to greatly expand his steamship line. In 1917, the Corps of Engineers dredged another channel from the mouth of Tampa Bay to the Port of Tampa, instantly making the city an important shipping center. Port Tampa: Established in 1885 by Henry B. Plant at the terminus of the Plant System railroad line on the eastern shore of Old Tampa Bay. Eclipsed in tonnage and importance by the Port of Tampa in the early 1900s, but still an important arrival point for aviation fuel which is piped to nearby Tampa International Airport and MacDill Air Force Base. In 1924, the Gandy Bridge over Old Tampa Bay reduced the driving distance between Tampa and St. Petersburg to 19 miles (31 km). Ten years later, the Davis Causeway (later renamed the Courtney Campbell Causeway) was built between Clearwater and Tampa. More bridges criss-crossed Tampa Bay over the ensuing decades, making travel between the surrounding communities much faster and furthering the economic development of the Tampa Bay area. 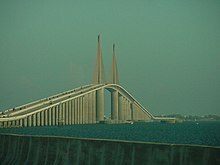 Sunshine Skyway Bridge: Opened 1954. Spans Lower Tampa Bay from Bradenton on the south to St. Petersburg on the north, greatly reducing travel times between Manatee and Pinellas Counties. Part of I-275 & US 19. Gandy Bridge: Opened 1924 (1st bridge over Tampa Bay). Spans Old Tampa Bay from Tampa on the east to St. Petersburg on the west. Part of U.S. Route 92. Howard Frankland Bridge: Opened 1960. Spans middle of Old Tampa Bay from Tampa on the east to St. Pete on the west. Part of I-275. Courtney Campbell Causeway: Opened 1934. Spans northern Old Tampa Bay from Tampa on the east to Clearwater on the west. Part of Florida State Road 60. Bayside Bridge: Opened 1993. Runs roughly parallel to the western shore of Old Tampa Bay from Largo / St. Petersburg on the south to Clearwater on the north. Built to help relieve traffic congestion on nearby US-19. 22nd Street Causeway: Opened 1926. Bridge portion spans the mouth of McKay Bay near Port Tampa Bay. Part of U.S. Route 41. 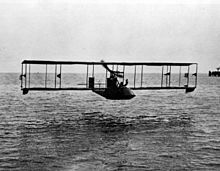 Tony Jannus piloting the world's first scheduled airline service over Tampa Bay, 1914. The aircraft is a Benoist XIV. While the construction of bridges made air travel across Tampa Bay unnecessary, several airports have been built along the shoreline. Albert Whitted Airport on the St. Petersburg waterfront and Peter O. Knight Airport on Davis Island near downtown Tampa were both established in the 1930s. Later, Tampa International Airport and St. Pete–Clearwater International Airport were established on opposite sides of Old Tampa Bay, and MacDill Air Force Base opened on the southern tip of Tampa's Interbay Peninsula. ^ "Tampa Bay Watershed - Hillsborough River, Alafia River, Manatee River - Florida's Water: Ours to Protect". Protectingourwater.org. Archived from the original on 2010-03-03. Retrieved 2010-04-10. ^ Craig Pittman (July 7, 2008). "Media found the Rays, lost the 'Bay'". St. Petersburg Times. Archived from the original on June 7, 2011. Retrieved 2010-04-10. ^ Kunneke, J.T., and T.F. Palik, 1984. "Tampa Bay environmental atlas", U.S. Fish Wildl. Serv. Biol. Rep. 85(15) Archived 2010-05-27 at the Wayback Machine, page 3. Retrieved January 12, 2010. ^ "Holocene and Pleistocene Marine and Non-marine Sediment from Tampa Bay, Florida". harvard.edu. Bibcode: 2002AGUFMOS61A0191E. ^ "GulfBase - Tampa Bay and Keys". gulfbase.org. Archived from the original on 13 September 2015. Retrieved 12 April 2015. ^ "Can manatees survive without warm waters from power plants? ", Tampa Tribune (tbo.com), Jan. 8, 2011. ^ "Florida's Indians". ufl.edu. Archived from the original on 2 April 2015. Retrieved 12 April 2015. ^ "Florida anthropologist". ufl.edu. Archived from the original on 22 February 2015. Retrieved 12 April 2015. ^ "Manasota". Co.pinellas.fl.us. Archived from the original on 2016-03-04. Retrieved 2010-04-10. ^ "Tocobaga Indians of Tampa Bay". Fcit.usf.edu. Archived from the original on 2010-04-06. Retrieved 2010-04-10. ^ "University of Georgia Libraries, Hargrett Rare Books and Manuscript Library: 1584 map of La Florida". Archived from the original on January 14, 2009. Retrieved April 27, 2009. ^ "University of Georgia Libraries, Hargrett Rare Books and Manuscript Library: 1695 Spanish Map". Archived from the original on June 24, 2009. Retrieved April 27, 2009. ^ "Historical Map Archive: The Peninsula and Gulf of Florida, or New Bahama Channel, with the Bahama Islands". Archived from the original on February 14, 2009. Retrieved April 27, 2009. ^ "University of Georgia Libraries, Hargrett Rare Books and Manuscript Library: An exact map of North and South Carolina & Georgia, with East and West Florida". Archived from the original on June 1, 2010. Retrieved April 27, 2009. ^ "Historical Map Archive: 1933 Map of Florida by A. Finley, Philadelphia". Archived from the original on February 14, 2009. Retrieved April 27, 2009. ^ "Tampa Bay". epa.gov. Retrieved 12 April 2015. ^ "Ten Communities: Profiles in Environmental Progress". nara.gov. Archived from the original on 13 January 2015. Retrieved 12 April 2015. ^ "Henry Plant's Southern Empire". plantmuseum.com. Archived from the original on 3 April 2015. Retrieved 12 April 2015. ^ "Corps, Port Consider Channel Widening Options". Baysoundings.com. Archived from the original on 7 September 2015. Retrieved 5 September 2015. ^ "The Spanish–American War". plantmuseum.com. Archived from the original on 17 February 2015. Retrieved 12 April 2015. ^ "Sanctuary Islands". audubon.org. Archived from the original on 2 April 2015. Retrieved 12 April 2015. ^ Hammett, Yvette (12 April 2015). "Port Tampa Bay has to dredge with care in nesting season". Tampa Tribune. Archived from the original on 26 February 2016. Retrieved 12 April 2015. ^ "Port of Tampa will fuel region with new $56 million petroleum terminal". Tampa Bay Times. Archived from the original on 24 September 2015. Retrieved 12 April 2015. ^ "About the Tampa Port Authority". Archived from the original on 16 September 2015. Retrieved 5 September 2015. ^ "Port Facts". portmanatee.com. Archived from the original on 2 April 2015. Retrieved 12 April 2015. ^ "Port St. Pete - St. Petersburg". www.stpete.org. Archived from the original on 2015-04-01. ^ a b "The World's First Scheduled Airline". Smithsonian National Air and Space Museum. 2007. Archived from the original on 2 October 2015. Retrieved 23 August 2015. ^ a b Provenzo. Jr. , Eugene F. (July 1979). "The St. Petersburg-Tampa Airboat Line". The Florida Historical Quarterly. 58 (1): 72–77. JSTOR 3014618. ^ Blizin, Jerry (20 October 2009). "Spectacular Sunshine Skyway replaced ferryboats in 1954". Tampa Bay Times. Archived from the original on 24 September 2015. Retrieved 23 August 2015. Wikimedia Commons has media related to Tampa Bay. Wikisource has the text of The New Student's Reference Work article " Tampa Bay". Wikivoyage has a travel guide for Tampa Bay.